Photovoltaic cells are connected electrically in series and/or parallel circuits to produce higher voltages, currents and power levels. 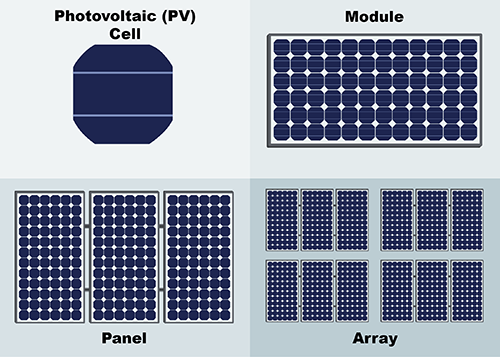 Photovoltaic modules consist of PV cell circuits sealed in an environmentally protective laminate, and are the fundamental building blocks of PV systems. Photovoltaic panels include one or more PV modules assembled as a pre-wired, field-installable unit. A photovoltaic array is the complete power-generating unit, consisting of any number of PV modules and panels. Figure 1. Photovoltaic cells, modules, panels and arrays. The performance of PV modules and arrays are generally rated according to their maximum DC power output (watts) under Standard Test Conditions (STC). Standard Test Conditions are defined by a module (cell) operating temperature of 25o C (77o F), and incident solar irradiance level of 1000 W/m2 and under Air Mass 1.5 spectral distribution. Since these conditions are not always typical of how PV modules and arrays operate in the field, actual performance is usually 85 to 90 percent of the STC rating. Today’s photovoltaic modules are extremely safe and reliable products, with minimal failure rates and projected service lifetimes of 20 to 30 years. Most major manufacturers offer warranties of 20 or more years for maintaining a high percentage of initial rated power output. When selecting PV modules, look for the product listing (UL), qualification testing and warranty information in the module manufacturer’s specifications.